HIBISCUS FLOWERS bloom on Lucerne year ‘round. 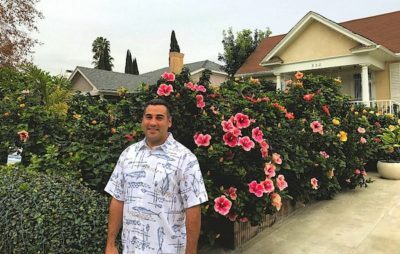 “Everyday is an exciting one here,” says Darren Eminian, who has got to know the hummingbirds and other visitors drawn to his yard. Darren Eminian’s home on N. Lucerne Blvd. is a nature lover’s delight, a field laboratory of sorts, where 300 hibiscus plants bloom year round. It’s been six years since Eminian hung up his suit from years of working in the banking and insurance industry to begin his research in how best to grow the colorful flowers. His efforts paid off, judging from his lush front yard, which is a riot of color, and, he recently launched his landscape gardening business, aptly called, Colorlicious Hibiscus Gardens. After returning from one trip to the islands about 10 years ago, the Lucerne Blvd. couple agreed to nix their dull dogwood hedges for the showy flowers they admire on their travels. Eminian started with a few “exotic fancy hibiscus” plants from supplier Hidden Valley Hibiscus. Their blooms grow up to 10 inches, about the size of a dinner plate, and while from the tropics, they thrive along the Southern California coastal plains, from Santa Barbara to the Mexican border. “They have huge blooms with amazing combinations of colors that no other plant can compare to,” says Eminian, holding one of the trumpet-shaped flowers, its petals a burst of shades of burgundy and red. “Every day people stop and go crazy over my blooms. Most people just love flowers… You know you have something special when a group of teen skateboarders go down the sidewalk in full teen conversation and stop, turn around and go back to look at the flowers,” he adds proudly. Eminian experimented with volcanic soils, drainage and fertilizer. While hardy, the hibiscus plants are not easy to grow, but they are drought friendly and require little water, a few minutes a week on a drip. “Once established, they do well on their own,” he says. They also do well with other drought-friendly species, including citrus trees. The area’s ecosystem also suffers, he says. There’s no ecosystem problem on this little plot on Lucerne, where swallows swoop down daily. They feast on the aphids, explains Eminian, as do lady bugs and several hummingbirds that call his garden home.